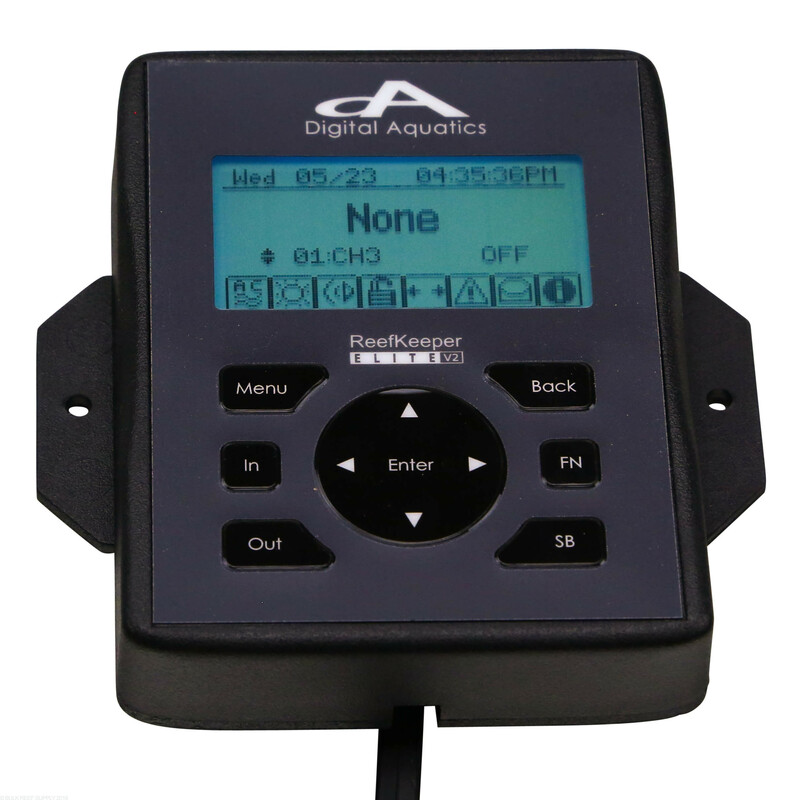 Monitor and control your aquarium set up with the ReefKeeper Elite PLUS. Check the full details below for complete ReefKeeper Elite features! Upgradeable and expandable aquarium controller from Digital Aquatics, the Elite comes with many essential accessories which other controllers require you to buy separately. 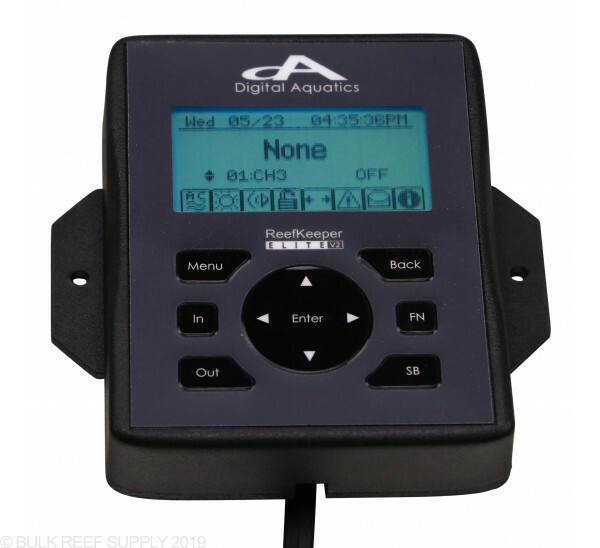 Free software upgrades from Digital Aquatics are easy to install and keep your ReefKeeper Elite up to date with the latest firmware. Advanced 11 button interface makes the ReefKeeper Elite intuitive and easy to use. 128 x 64 graphical display with status icons, and a variety of other important information. The Home screen displays icons and easy to read information giving you "at a glance" system status updates. Easy scroll through function allows you to view all the data for your tank with the touch of a button. 250+ programmable channels allows for the control of over 250 outlets at once and ensures that you won't outgrow your RKE. Multiple mounting options keeps your aquarium setup looking custom and professional. Simple menu system for easy configuration. 63 alarms with audible and visual alerts notify you when critical system parameters are out of range. 63 dedicated and programmable timers which can be mixed and matched with the Muli-timer in any fashion to create even more complex functions. Multi-timer function allows you to stack up to four unique timers to create any on/off cycle desired. This feature is great for dosing and other scheduled tasks that don't happen on a regular interval or for creating your own special cycle based on your needs. The Data logging feature logs data, for up to 32 probes and devices, onboard with over 1000 data points each with the addition of a NET module. Sure On metal halide control protects metal halides, in the event of a power interruption, by ensuring that there is a 15 minute "cooling" delay before they turn back on after power is restored. Light Timer with weekday/weekend schedules and safety temperature cut off. Use your RK Elite to set lighting cycles that cater to your viewing schedules as it changes throughout the week. The light timer will shut down the lights if the temperature rises above a set point. With the Moon Light Controller (optional) the RK Elite system can simulate a true lunar cycle. 2 Standby/Feed/Service modes gives the flexibility to configure multiple service modes for activities like feeding, water changes and other maintenance. Control functions can take any probe input and act on it with a user settable hysteresis. This includes but is not limited to pH, ORP, temperature and micro switches. Sumps and skimmers pump control allows you to program the sump and skimmer pump functions to be off in standby and even have a standby delay to make sure the system doesn't overflow or over skim food after a feeding. Wavemaker A/B and C/D pump control: The RKE features expanded wavemaker controls that allows you to set up multiple pairs of powerheads to get all the turbulent flow you need. Top-off control: controls a pump based on a micro switch for top-off and other features. Key Lock: keep other people from messing with your ReefKeeper Elite settings. Battery Backup: user serviceable and does not require service for replacement.